I’m bucking journalistic convention here. I’m insinuating myself into the narrative. I’m using the first-person singular. Daphne Athas inspired me. Words never fail Daphne Athas, not for long. If the right one isn’t immediately at hand, off she goes, on to another, seemingly unrelated but altogether integral topic, only to return, just when you thought you’d lost your way, to the word in question. Perhaps it’s one from her own collection – among which “hokery-pokery,” “pickery-uppery” and “lookity-down” are to be found. Athas doesn’t break the rules; she rewrites them in an idiom her own and inclusive. In the legendary creative writing classes she taught at UNC for four decades, she accosted grammar and lifted its wallet. Her stylistics class was originally called “Glossolalia,” roughly translated from its Greek origin as “speaking in tongues.” In it, she encouraged her students to explore the flexibilities of language, to experiment with grammatical style and rhythm, using a variety of innovative exercises, including performance art. She published a book called Gram-o-Rama: Breaking the Rules (well, OK, so maybe she does break a rule here and there), in which she carried forth her lessons to the masses. How about a theme park ride modeled on Daphne Athas? Many who’ve had the pleasure of conversing with Athas in her nearly 88 years have tried to describe the experience – but none, I’ll wager, have entirely succeeded. I arrive at her home in Carrboro with half-a-dozen or so roughly sketched questions and three full hours to expend. Four hours later, I’ve neglected to glance at my list. We meander from Aesop’s Fables, through LSD, to Michelle Bachmann and Xenophon. We chat briefly about the movie Pumping Iron, the arc of Arnold Schwarzenegger’s career, PACs and their influence, wampum, heritage, the Duke of Wellington and money supplanting standing. Words bridge the divide (a slender one, Athas will tell you) between reality and myth. Words are the portal to a world of possibility. She’s made beautiful music of language, and that songbook is always before her. By her mid-20s, Athas had published her first novel, The Weather of the Heart. In 1971 came the somewhat autobiographical Entering Ephesus, which was selected by Time Magazine for its Ten Best Fiction List for the year. Last year brought Athas’s long-awaited “social memoir,” Chapel Hill in Plain Sight: Notes from the Other Side of the Tracks. The book begins with Athas’s 1938 transplantation from a storybook New England childhood to a shack, dubbed by Athas and her family “The Shack,” at the top of Merritt Mill Road in Chapel Hill. There she grew up with her two sisters and brother, with pleasures that surpassed the hardships. Athas’s father, a stockbroker, had lost his money in The Great Depression. He wanted an education for his children, knew it could be had inexpensively in North Carolina, and, moreover, had been told by a man up North that Chapel Hill was the Athens of the South. “I think Daddy liked that,” Athas says. Pan Constantine Athas was a Greek immigrant, a graduate of Harvard Law School, an eccentric and an explorer. The Athas household was “the bohemian thing” to all comers, from university professors and students to ambitious young sons of Carrboro millworkers, like Wayne Williams, Athas’s first boyfriend. “We made an intellectual fetish out of being outcasts,” Athas says of those days and nights – 4 a.m., walking the powder-dust streets of Carrboro, defining myths and articulating the ineffable – the two of them, reading everything, inspired by the outlaw artist/intellectuals, by Paul Green and Richard Wright, right here in Ephesus – shouting in the night. They were drunk with learning – book learning and real-life – and felt its power. One hot night past 2 a.m. in the summer of 1941 when Wayne and I were returning to Wayne’s house from the library, we crossed over the railroad tracks and turned from the paved Carrboro Main Street onto the dirt road that was Weaver Street. In the fork, the wooden post office was dark. The town was fast asleep, not a whine even from flea-ridden dogs dreaming beneath the millhouses. We were conscious of our power. We could do anything. They played with the shadows of branches, “a scrim of shadows magnified and distorted by the streetlights to three times their real size,” shapes suggesting arms, motioning to them, pointing the way, but to where they couldn’t know. And it still is. Athas cavorts in those nights. Words can do that, access the past and the future, allowing us to better understand who we are – and who you are. Words are the combination that unlocks empathy. Empathy: It’s so much what Athas’s life and work is about. Her concern, though, is that empathy is old-school now, having lost its place in an increasingly virtual world. But she’s afraid that in saying so, she’ll be dismissed as a casualty of frumpery, of jaded fuddy-dudditry (my word; her inspiration). But it would be a serious mistake to discount Athas’s engagement in the world around her. 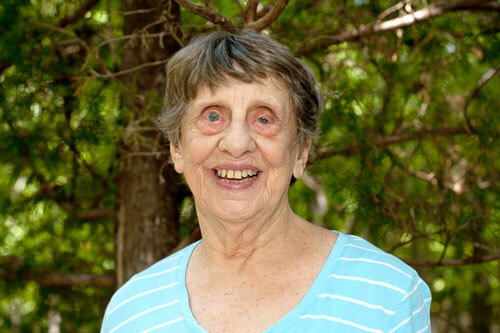 A fall last winter slowed her down somewhat, but her recovery is coming along. She worries with where we’ve arrived: “I don’t think you can have a proper country with so few people at the top having so much money. How can it be possible to have a democracy that works like that? In the everyday, “I look at people; I talk with people. They’re nice. But not otherwise. Perhaps the most remarkable thing about conversation with Daphne Athas is the curiosity with which she infuses it. “What do you think?” “Don’t you agree?” She really wants to know. Is it a curiosity born of empathy, or the other way around? Regardless, curiosity is encoded in her words and shapes her world, a world that remains a mystery. “I had so many stories told to me in my youth that I had millions of possibilities, millions of options. And then there was a whole library to get more myths, to find out what was true or what wasn’t true. “What is true? I think it’s awfully relative.” It’s a little of that hokery-pokery.